We take clients from concept to delivery to identify your needs and tailor technology solutions for your application and environment. 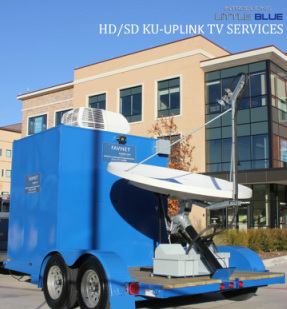 We have designed Satellite & Microwave back-haul, WiMAX, Campus TV, Corporate Communications backbone, IPTV, TV & Radio Stations worldwide. FAVNET combines SIP Provisioning (TTPL) with Barracuda CudaTel SIP PBX to offer the best solutions today. Convert your old PBX to VoIP, we’ll show you how to save! Little Blue was commissioned in the Fall of 2013. Designed for News (DSNG) Sports and Entertainment applications. (Very Small Aperture Terminal) satellite communications for oil/gas operations, drilling companies as well as the broadcast and media industries. Remote satellite internet, phone and fax include rental phones, rental fax, rental internet services for http and ftp applications. Combined with the best secured Teleport facilities with partner TrustComm, its rental fleet of mobile VSAT communications trailers for quick efficient deployment; 24x7x365 making us “Always On”. Our mobile rental fleet is delivered by well trained iDirect certified technicians with years of experience working in the oil, gas, entertainment and broadcast television industries. With our IP based solutions, we can deliver dedicated Voice, VoIP, and Internet and secured VPN to your remote sites anywhere in North America. 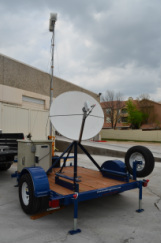 Our mobile VSAT rental trailers are equipped with propane powered back-up generators and UPS for auto-start, regardless the power source on site. Video Production + VSAT + WebCast = Your Content Delivered. From concept story-board to final video delivery, FAVnet can produce your next meeting, seminar, training video or church mission. We can work with and empower your staff to get the look and sound to deliver your message to the audience on time and on budget with clarity and impact. Video Services Director Kevin Harkins is a nationally recognized talent for musical composition, video production and editing. We can uplink, connect and stream your production live to the desk top, auditorium or TV set.